check out where packrafts are taking us now! 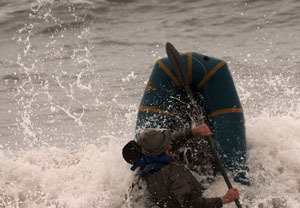 Packrafts have changed my life. At least, they've changed my wilderness trekking life. 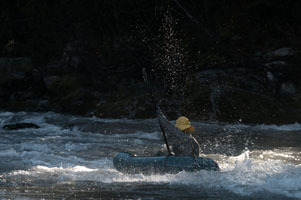 Hig and I started carrying Sevylor rafts in 2000, mostly to cross rivers that were too big for us to wade. 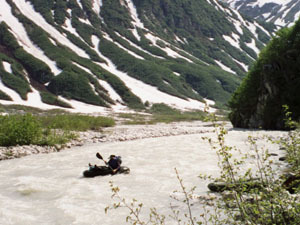 We took a pair of Sevylor trail boats down the Alaska Peninsula in 2001. After a few years, countless punctures, a couple snapped paddles, and multiple copies of the Sevylors, we upgraded to Alpacka rafts in 2003. These boats are amazingly tough. Packrafting is no longer just a way to cross problematic bodies of water, it's a great way to travel. We plan our routes to take advantage of the rivers, lakes, and bays that would have otherwise been in the way. While many people use packrafts in rivers, we also use them for ocean crossings (up to 5 or 6 miles). They were a crucial ingredient in our largest expedition to date: a four-thousand mile journey on the North Pacific Coast, from Seattle to the Aleutian Islands. 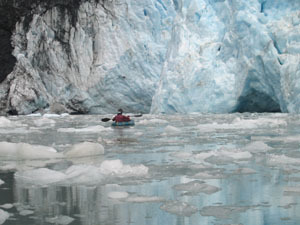 The packraft allows to combine walking and skiing with paddling. 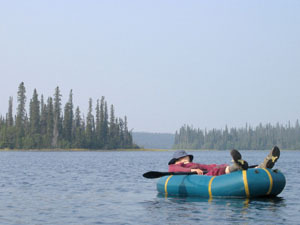 Without a packraft, we could never have made it through the islands and fjords of B.C. and Southeast Alaska, crossed the rivers flowing from the Gulf of Alaska's massive glaciers, crossed to Unimak Island (first in the Aleutian chain), or floated the rivers that helped us on our way. In the interest of full disclosure, I should mention that since getting into packrafting, we've gotten to know Sheri Tingey (who makes Alpacka rafts), and Alpacka has become one of our sponsors.